We would like to be able to test new banners in Revive Adserver and see them on the website to make sure that they work. That would enable us to verify that the ads (often Flash ads) do not interfere with other Flash content on the pages. However, until we have completed our checks, we don’t want the visitors of the site to see them yet. Is there a way to do this? You could setup the ad so that it is displayed when some word or phrase is present in the URL of the website, and then add this phrase to your web address for testing purposes. Personally, I prefer the second option, because it means I can use it anywhere, without having to look up the IP address of the location that I or others that I collaborate with happen to be working at. It doesn’t really matter what the phrase is that you use here, the only requirement is that the phrase is unlikely or impossible to be part of a real page URL on the site. Once you’ve completed this, you can link the campaign to the relevant zones just like you’re used to. Now that you’ve prepared the campaign for testing, it’s time to test the banners on the live site. This is the easy part. Just open your browser and go to the web page address where the banners should be displayed. Let’s assume here that you’re working on the home page of a website at www.example.com. You may have to refresh the page a couple of times if there are other campaigns that are active on the same zones on this web page, but eventually you should see the banners of the campaign you’re testing. 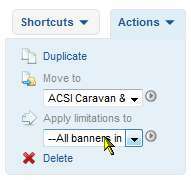 Once you’ve made sure the banners work well, you can simply go back to the delivery limitations tabof the banners being tested and remove the temporary delivery limitations. To do that, simply click the red ‘cross’ symbol to the right of the delivery limitations, and then save the changes on the page.